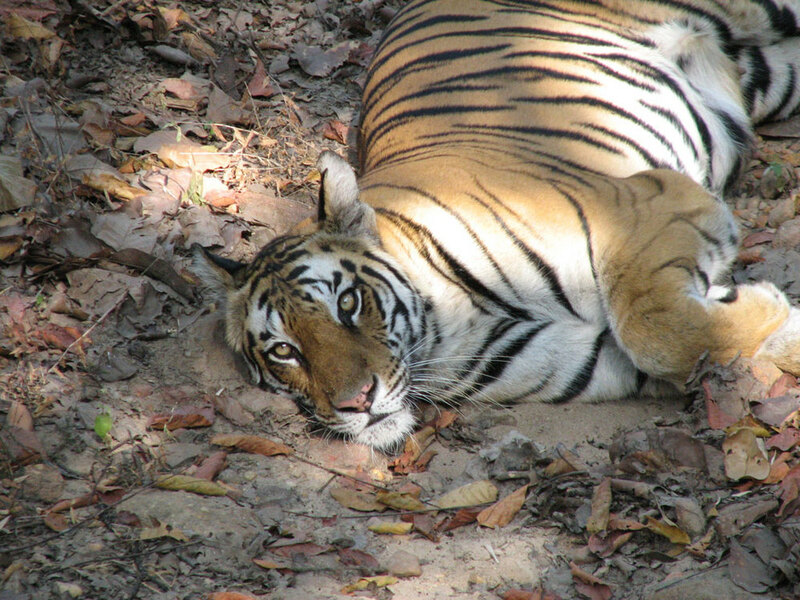 Bandhavgarh has India's highest tiger density and your chances of sighting the big cat are very good here. The nearest airport is at Jabalpur, 190 km away. Bandhavgarh in Madhya Pradesh is a comparatively small National Park- only about 440 square km- but is abundantly stocked with game. 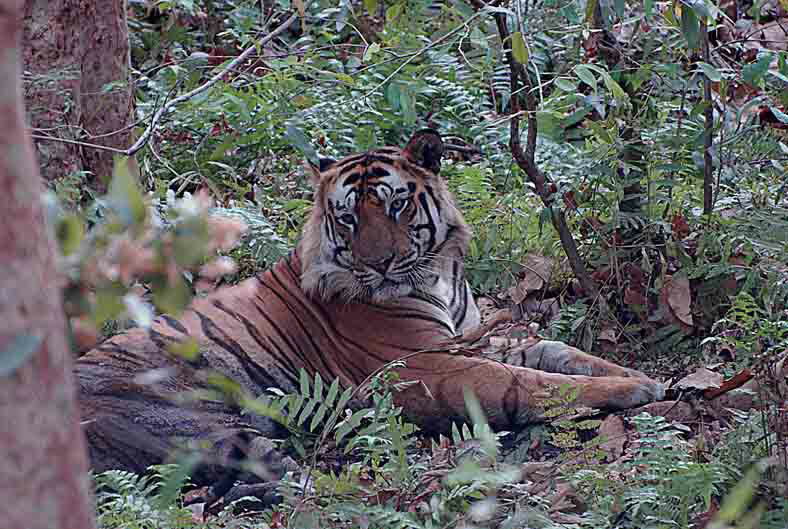 The tiger population at Bandhavgarh is probably the highest in India. Formerly the hunting reserve of the princely state of Rewa, the park comprises the area where the first white tigers were discovered in the wild. The terrain consists of great rocky hills rising sharply from the swampy and densely forested valley bottoms. The highest of these 32 hills is crowned by the 2000 year old Bandhavgarh Fort, rising over 2500 feet above sea level. The valleys around bottom out into swampy meadows- ideal for wildlife viewing on elephant back or from jeeps. Scattered around the fort are several caves containing shrines and ancient Sanskrit inscriptions. Location: Umaria district, Madhya Pradesh. The nearest airport is at Jabalpur (190 km). Further away is Khajuraho (250 km). Prominent fauna: Jackals, foxes, hyenas, tigers, tigers and more tigers! 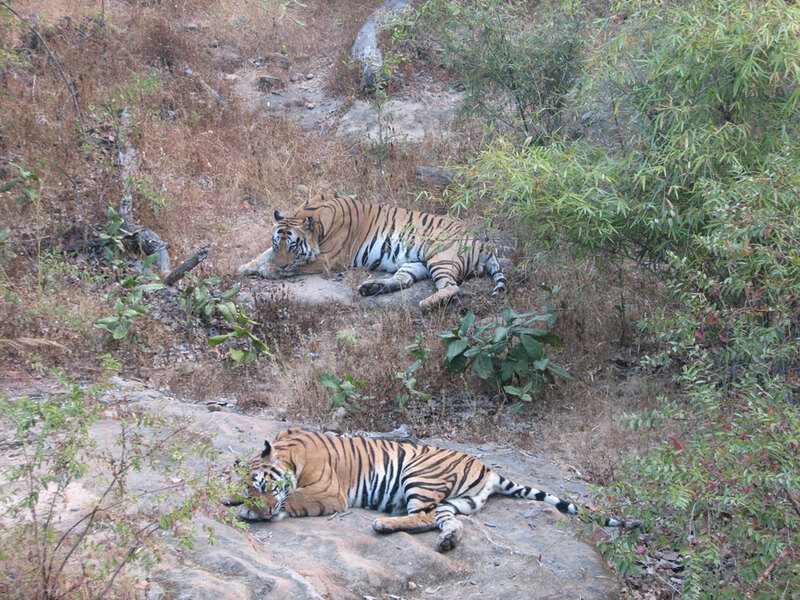 The density of the tiger population at Bandhavgarh is among the highest in India. 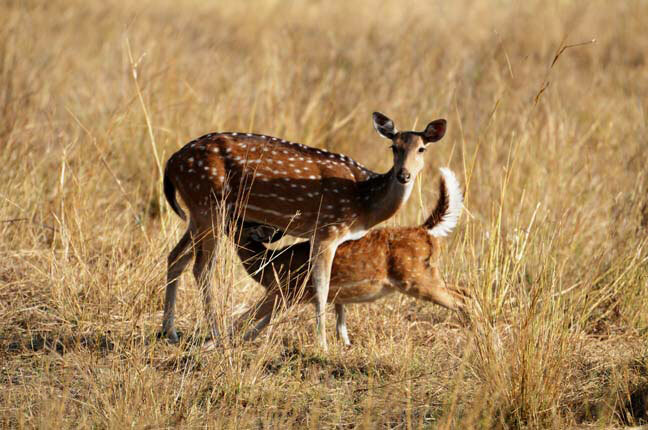 Their prey includes wild pig and a wide variety of deer, including the chausingha (four-horned antelope), chinkara (Indian gazelle) and nilgai (blue bull). Kites, eagles, vultures, teals egrets, ibis and cranes are some of the more common birds. Reptilian species include cobras, kraits, vipers and pythons. Best time to visit: November to June. Closed from July to October. 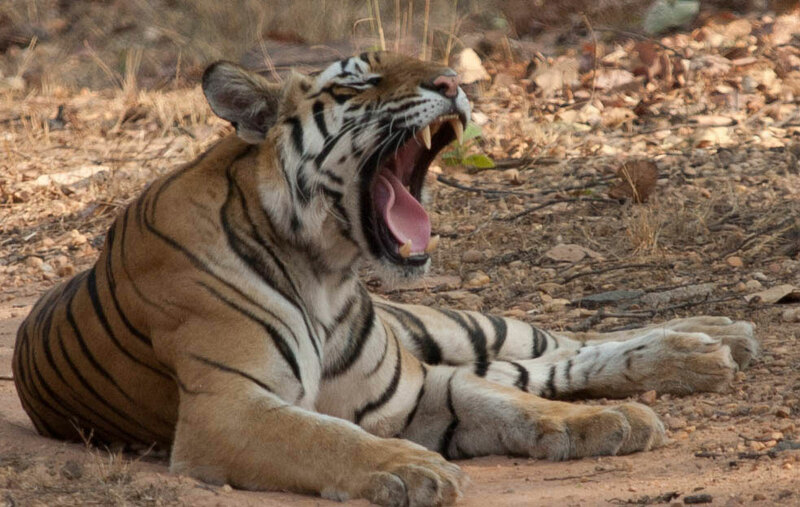 Destination Guide: Bandhavgarh's history dates back to the 3rd century A.D. In Indian mythology, the fort on Bandhavgarh hill is said to have been built by Lord Rama for his brother Lakshman during the Ramayana period. There are a number of man-made caves in and around the 2000 year old fort with inscriptions and carvings which date back to 129-168 A.D. 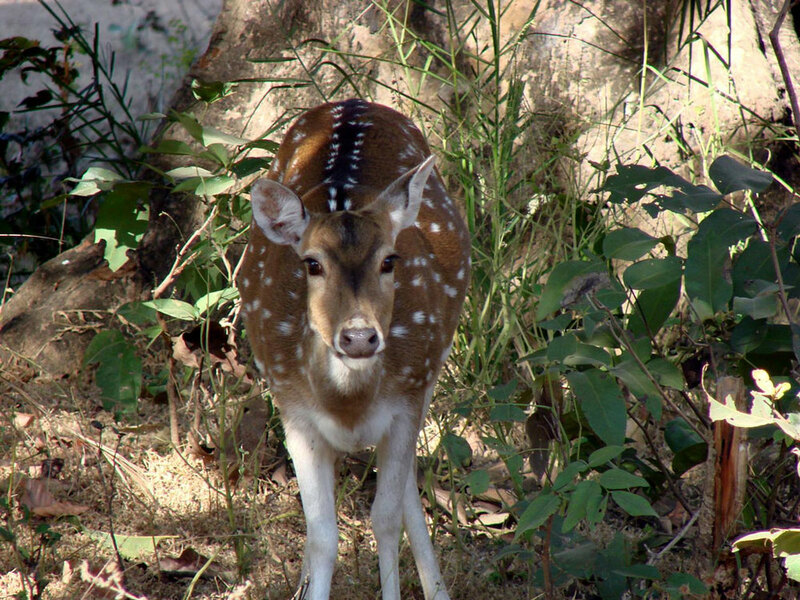 Considered the crown in the wildlife heritage of Madhya Pradesh, Bandhavgarh is known for the Royal Bengal Tigers, chital (spotted deer), leopard, gaur, sambhar, and many more animal species. Bandhavgarh National Park is nestled in the Vindhya mountain range of central India, full of picturesque hills and densely forested ravines. Bandhavgarh was the former hunting preserve of the Maharajah of Rewa and at present is a famous natural hub for White Tigers. The holiday season around December and January can get somewhat crowded, as also the dates around the festivals of Diwali (Oct-Nov) and Holi (March). March onwards continues to be the best time for tiger sightings, as the weather gets hotter and the animals venture out. Safaris in the jungle take place in jeeps and on elephant-back. Accommodation: There are again a number of options here, including the Mahua Kothi Resort, Tiger Den Resort and Mogli Jungle Resort. Write to us and we can advise you according to your tastes. Note: The temple town of Khajuraho is only about 240 km away. We highly recommend you make the time to visit. More information on Khajuraho in our Jewels of India tour.